“I thought would bother me to be out there, but I’m actually quite comfortable with the choice,” said Hudon. It is highly uncommon that you would find anyone in this industry that isn’t competitive so it’s hard to believe how well this transition is going for Hudon. But as always, life and health come first for any member of this community. Hudon is a third-generation horseman with over 30 years of experience. His accomplishments include winning the Western Canada Pacing Derby and Northlands Filly Pace as well as owning a numerous number of Sire Stakes fillies and a couple of colts. “I have had a great ride,” said Hudon. “My goal was to get 3,000 wins and I’m about 110 wins short of that goal, but I’ve got nothing to complain about […] this business has been great to me and to my family,” said Hudon. 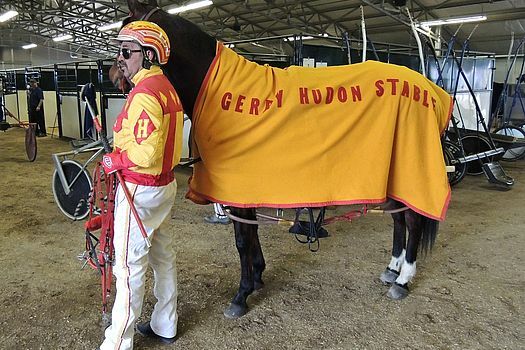 Hudon also sits on a committee that has been struck involving all Canadian racing jurisdictions in partnership with the United States Trotting Association. The committees are attempting to unify the rules of Standardbred racing for Canada and maybe even all of North America. When asked about that process, Hudon said, “It’s actually going [well], but it’s a slow process because there are a lot of things that need to be approved. I strongly believe that our industry needs to be unified across Canada and the United States.” Although there are many rules that need to be handled to unify the Standardbred racing industry, the most pressing of those are the 45-day qualifying rule, horse and racer drug testing and the Coggin’s test. “Not only do we need this consistency for the trainers and drivers, but the public needs to know about interference rules as the public is one of the biggest aspects of our game,” said Hudon. Although Hudon has retired from driving, his schedule remains busy this summer with his position on the Standardbred Canada Committee, training 15 horses and keeping an eye on his farm in the Edmonton area. Hudon is also looking forward to his Daughter, Jocelyn’s, wedding on July 7 to driver Phil Giesbrecht, a regular Century Downs trainer and driver. Century Downs Racetrack and Casino wishes Hudon and his family the best of luck with this summer’s festivities. Don’t forget to come watch the 148th running of the Belmont Stakes on June 9 from our spacious Off-Track Betting Lounge. Cheer on JUSTIFY as he tackles the Triple Crown! The Belmont post time is scheduled for 12 p.m. You can also try our Belmont Jewel, the official drink of the Belmont Stakes for only $9! The Century Downs Racetrack and Casino Father’s Day Brunch and Putting Contest will be held on Sunday, June 17 from 12 to 3 p.m. Please reserve your table at reservations@centurydowns.com. After you’ve treated Dad to his Father’s Day Brunch, sign him up for the Father’s Day Putting Contest. This contest is for Dad’s only. Register on June 17 at the table near the Winner’s Circle.